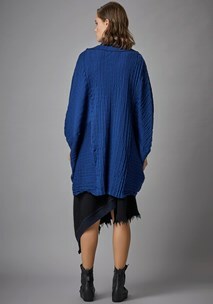 This pleated cape style cardigan features an irregular two-way pleat. The pleats change direction throughout the course of the pleat, and are reinforced with heavy lycra to give the pleats a beautiful bounce. This piece has a pleated collar, two 2 round openings for arms and two hand sized set-in pockets. The armholes are finished with a linked tubular bind. The Cocoon Pleat Cardigan | Cape comes with a stitch catcher kilt pin closure which can be used to fasten the garment as desired.